I’ve wanted to make this wreath for years. And finally… I did! This is an absolutely GORGEOUS, stunning, beauty! 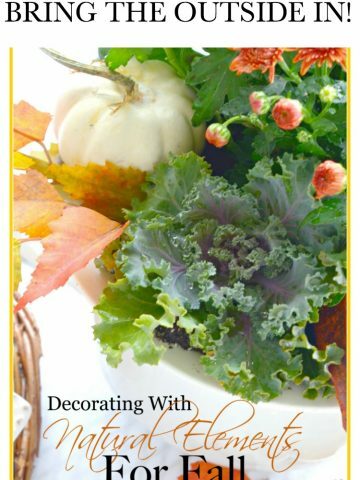 So full of autumnal color and texture and so so easy to make! My INDIAN CORN WREATH took about 30 minutes from start to finish. 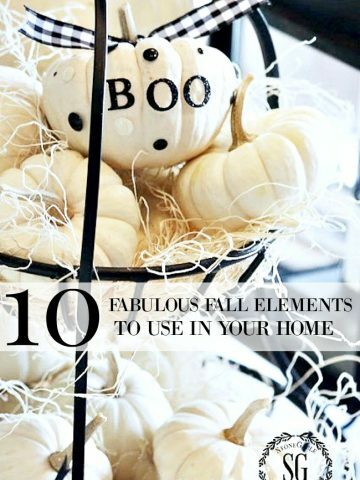 If you make one thing this fall, this should be it! It will look fabulous on your front door, from your walk, from the road… even going by it in a car!!! It’s not shy or demure… but offers a huge does of fall beauty and a hearty fall welcome! 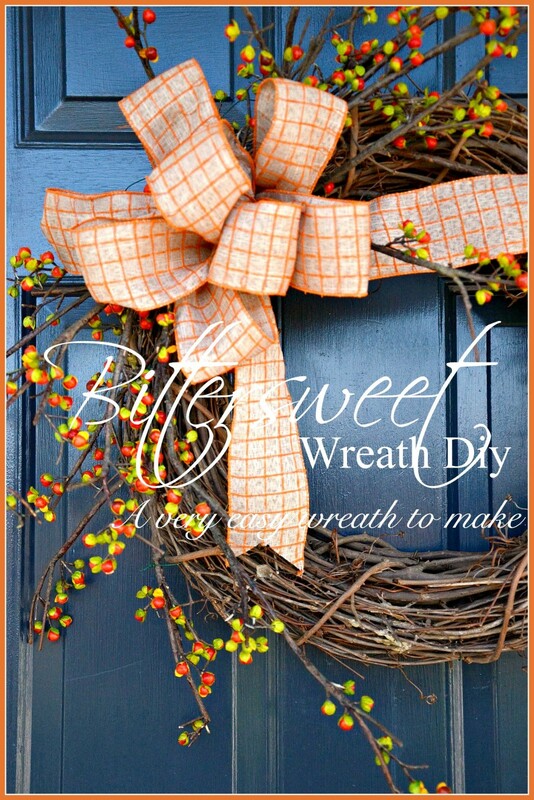 Let’s get started and make a wreath that will last until Thanksgiving… and for years to come! Today on our podcast Decorating Tips And Tricks we are talking about HOW TO CREATE A FALL VIGNETTE and sharing lots of ideas to put them together. We love vignettes! They are easy to make if you know a few simple tips… and we are spilling the beans today! You can listen to any or all of our 102 DTT podcasts HERE. I made a quick trip to my local Amish greenhouse to pick up about 40 multi-colored Indian corn! The cost for a 15 inch straw wreath was about $40.00. Not bad at all for all the WOW factor! This wreath can be made smaller… just decide what would look best on your front door! I’m so thrilled with how this wreath turned out! It really is magnificent! To keep the wreath from year to year it must be stored in a “mouse-free” zone or double bagged in a thick industrial garbage bag and tied together tightly! If you hang the wreath outside, make sure it it totally dry before putting it in any plastic bag. I’ll be keeping mine for a few years, so I’ll make sure to make it “mouse proof”! You might like to see an easy to make BITTERSWEET WREATH HERE. I think this wreath will be lovely over my mantle and bring autumn colors in nicely. Hope it’s as easy to make as you make it look! Very creative. 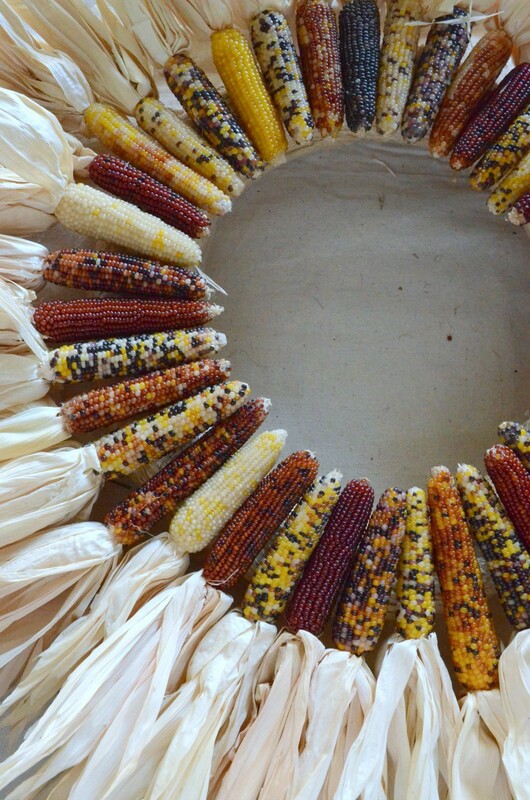 The Indian Corn wreath is gorgeous! Great idea!! Beautiful! I love making different wreaths for our front door; our neighbors always compliment me on them! This will be my next wreath project; it will be gorgeous on our black door. One question…they are mini Indian corns; approximately how long are they? The wreath is made with mini Indian corn and it has lasted about 6 years so far. Just be careful though if you have a basement or a garage the mice might think it is a snack. So these are the 4 inch mini ears? 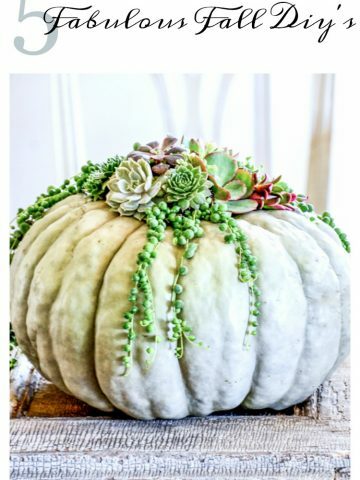 What a lovely fall decoration and so easy1 It celebrates Thanksgiving more..love it! Thanks for sharing. 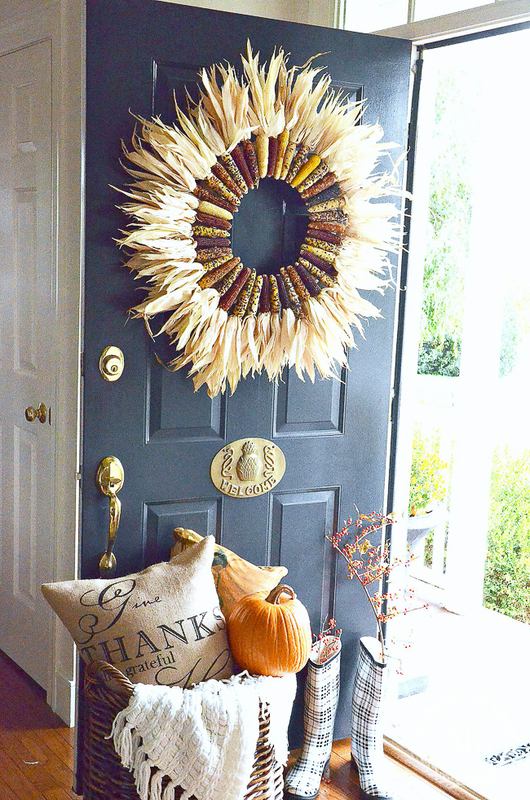 What an easy and beautiful fall wreath idea! It looks fabulous against your dark door, too. Thanks for sharing your easy tutorial with us at Merry Monday this week! I have read all of your posts, and you have skills when it comes to making wreaths , just wanted to let you know. 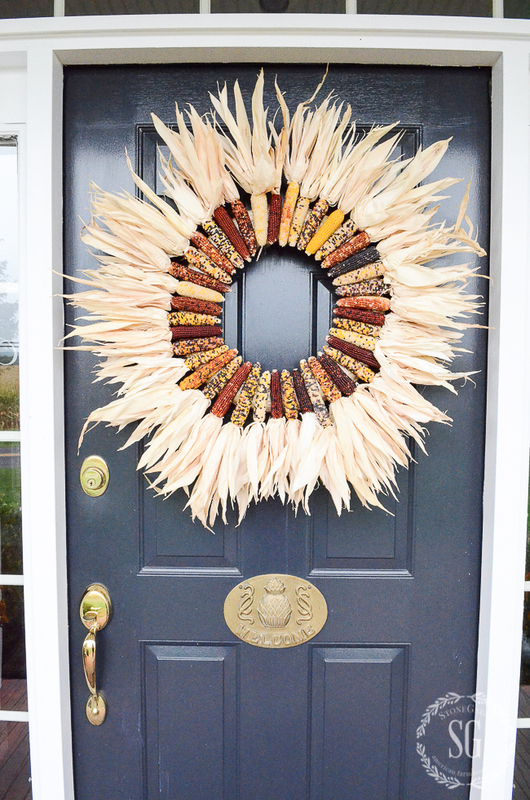 I just painted my front door black this spring and your fall Indian corn wreath would be perfect. please enter me into the drawing. Wow, Yvonne, that is stunning! And it looks easy enough even for a rank amateur. 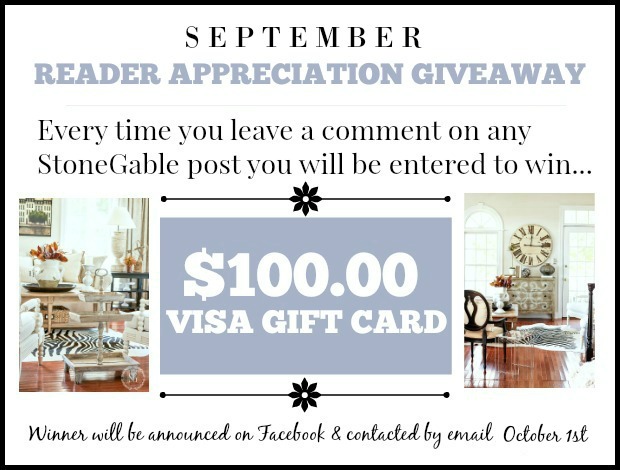 🙂 I also love that gorgeous Give Thanks pillow in the basket. Do you happen to have a link for that? Thanks, and God bless. This wreath makes a beautiful statement! My favorite of all. Thanks for the instructions, I will be making one. 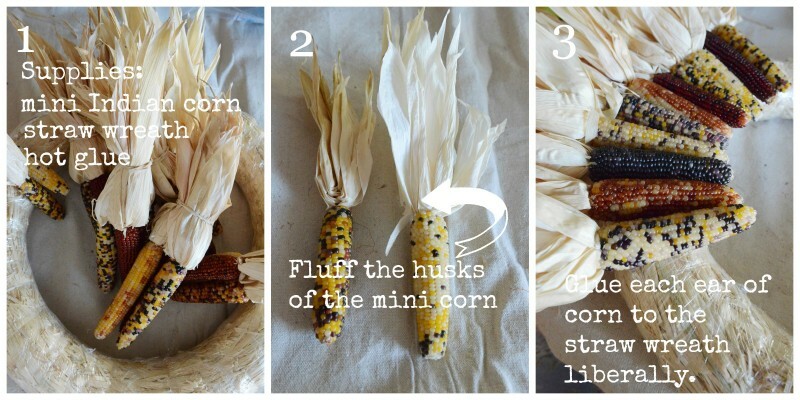 I am on the hunt for mini indian corns so that I can make this asap. I remember this post from a few years ago it seems and I never got around to making it then so I it is on my must do now for sure. Wow, that is a stunning wreath and looks so easy to make! Beautiful wreath and so easy to make. 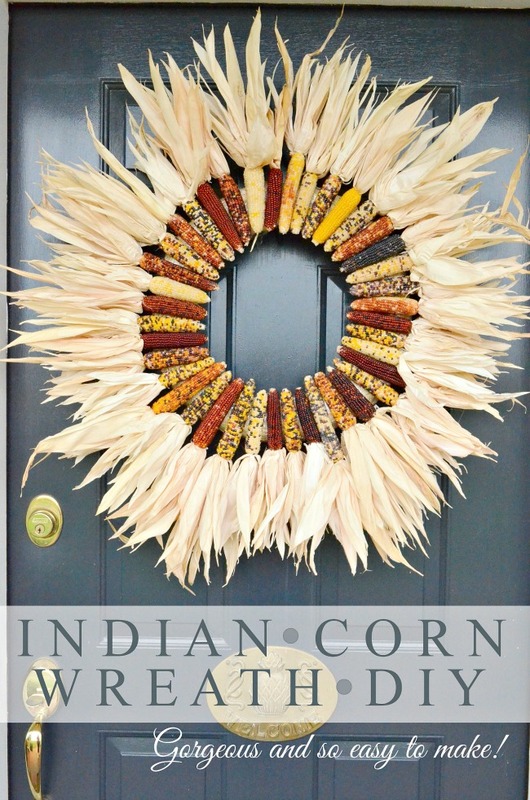 I just love the Indian corn wreath, so pretty and simple! one other warning is birds might eat the corn too. last year i saw a post that she made a corn wreath the post a few days later and said the birds eat it. The Indian corn wreath is stunning especially against the dark door! And I can’t believe it is so easy to do! Thank you for sharing this beauty! What beautiful colors God created for us to enjoy in nature’s bounty! 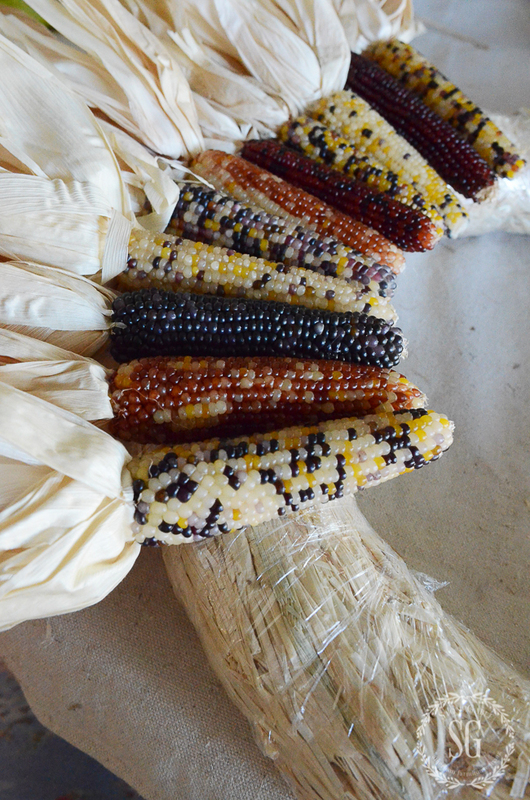 The Indian corn provides a spectacular “show” of the vibrant fall color palette, and the texture enhances the beauty. If I was a mouse, I would love this wreath, too!!! 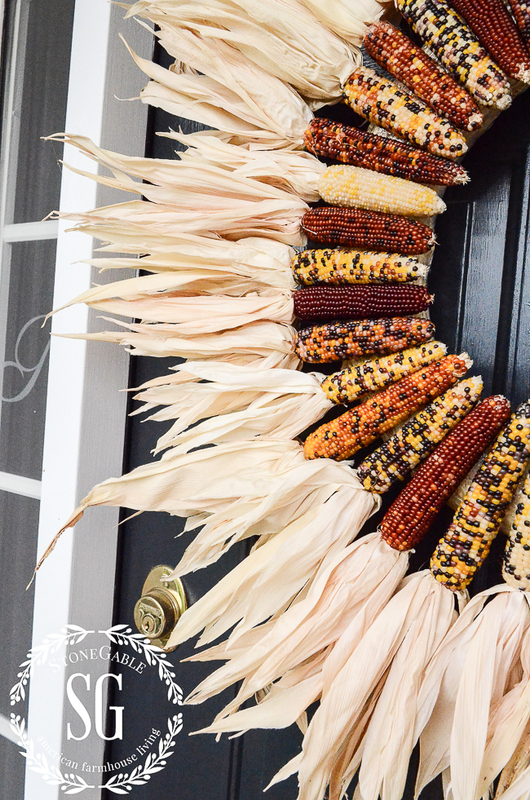 I love the corn wreath and how it pops on your door. The instructions look easy enough for an amateur like myself, so I may just give it a try this year. Thank you for the instructions and tips for storage. 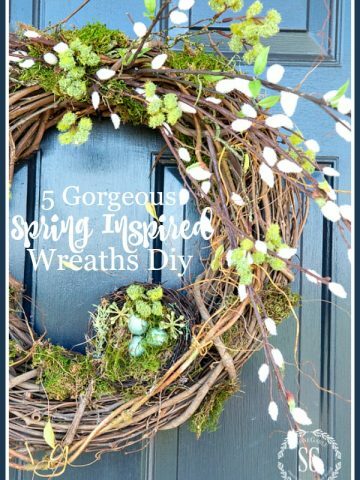 Amazing wreath, I can’t wait to try. That wreath is breath-taking! Wish I lived near an Amish greenhouse! Your wreath looks great on your blue front door. I love yours posts. Every photo is so professionnal and beautiful. A lot of bang for your buck! Look beautiful on your door and looks so easy too! Thanks Yvonne.